Real English Victoria is an innovative new ESL school that helps students learn real English for real life. Have you noticed REV’s newest student? Her name is Q. She walks around the school, greeting students and demanding scratches. It’s impossible to ignore her! We love having a dog at the school. Actually, there is another reason to have her here – we are studying her behaviour in preparation for our newest adventure. On April 1, 2020, REV will open REV Puppy – Real Dogs, Real Barking! That’s right – we are going to teach people and dogs! You can sign your dog up for obedience classes while you are learning English. “The Snow Storm of 2019” ?? Have you seen this meme on your Facebook or other social media? 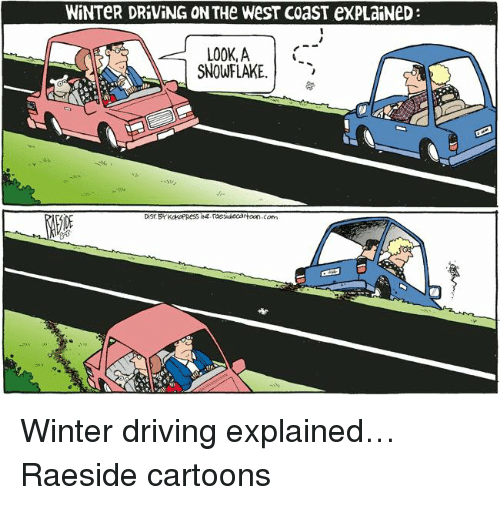 Or this cartoon from Raeside? Why do Victorians find them so funny? Do you enjoy the New Year? How do you celebrate it? Do you make special goals or plans? I know that New Year’s Eve is a special time for many people in different countries. In Canada, many people stay up until midnight on New Year’s Eve (December 31). They might have a private party with friends or family, or they might go to a pub or club. People love to dress up for New Year’s parties! Women often wear shiny or sparkly dresses. 10 seconds before midnight, they start to count: “Ten… nine… eight…” until, finally, “… one… HAPPY NEW YEAR!” They often cheer and hug (or kiss) the people around them. After that, some people sing a Scottish song called Auld Lang Syne. Most of us know the tune, but very few know all the words! So we usually just sing “la la la” and pretend that we know it! Many people make a New Year’s resolution. This is a personal promise or goal that you make to improve your life. Common New Year’s resolutions are: to exercise more, lose weight, visit family and friends more often, save more money, or learn a new skill. Some people take these resolutions very seriously, and they succeed. However, many people abandon their goals quickly. In January, it is common to joke about how long you were able to keep your resolution! What will you do this year? Will you stay up until midnight to welcome the New Year? Will you celebrate with family and friends? Or will you stay quietly at home and enjoy your rest? Will you make a New Year’s resolution, and will you keep it? No matter what you do, REV wishes you a very happy New Year! May your 2019 be filled with joy and love! Brrrrr… We’re having a cold snap! We have a special blog post from one of our amazing students, Mike! I would not say it is a challenge, but it’s a valuable experience for being an English learner that I had three interviews with different native English speakers. Before sharing these, please let me introduce myself first. My name is Mike and I was born in Taiwan. Following the traditional education in Taiwan, English was not a tool for me; it was a subject which I had to study for the exam and I hated it. For this reason, I hardly talked to anyone in English because it almost killed me. It was easy to keep the speaking part of English away when I was a student; I could be a good student only with reading and writing. But it didn’t work after I got a job and that was why I went to Canada to improve my English skills. I hope everyone had a lovely weekend. I know I did. I have some family time, some turkey, and some rest. I also enjoyed the orange leaves and grey skies – a typical Victoria fall. When I first taught overseas (in Mexico), my coworkers often asked me why Canadians celebrate Thanksgiving on a different day than Americans. (Canadians celebrate it on the second Monday of October, whereas the American date is the fourth Thursday of November). I realized I didn’t know, so I did a lot of research, but I was unable to find a clear answer. Some websites suggested it was because Canada is further north, so we harvest (pick vegetables) earlier. Some said it is connected with the arrival of explorer Martin Frobisher in 1578, who gave thanks for his safe journey. Another website I read said that it is simply because the Canadian and American governments chose different dates when they made Thanksgiving an official holiday! So the truth is, we don’t really know. The American Thanksgiving story of “the Pilgrims and the Indians [First Nations peoples]” is well-known, but Americans did not “invent” Thanksgiving; harvest festivals are celebrated in many different cultures. Thanksgiving is essentially a time to celebrate the harvest and be grateful for the good gifts that we have in our lives – food, family, friends. It’s that time of year again… the leaves are falling, the nights are cooler, and people all over Victoria start drinking pumpkin spice lattes. Fall has arrived! Do you like this season? Victoria normally has a very nice fall. Especially in the first few weeks, the weather is often dry and clear; this means blue skies, golden sunshine, and orangey-red leaves. I love it! Soon after, the rains will start to come. The fallen leaves will become slippery, and the sidewalks will be full of puddles – so watch your step! What do we eat in fall? This is when Canadians start to cook more winter dishes. These include soups, stews, and anything with squash in it. We also like to drink pumpkin spice lattes, gingerbread lattes, and peppermint mochas. Some people complain when coffee shops start offering these drinks at the end of August! What about fall activities? Well, some people will go camping on the weekend. It is a little colder than in August, but September is our last chance to get out into the forest, so some die-hard (crazy, committed) camping fans will still do it! Most farmers markets run until the middle or end of the month as well, so don’t miss this chance to stock up on (buy lots of) local vegetables. Orange leaves, hot drinks, and cool weather… have a great fall! Wow! It’s smoky out there! A lot of students tell us that one of their favourite things about Victoria is the clean air. Unfortunately, that is not true this week! As you can see, the air is thick and smoky. I even saw small pieces of ash floating down from the sky yesterday morning. Scary! As you can see, although the smoke is bad in Victoria, it is even worse in the interior (centre) of BC. News reports are saying that BC’s air quality this week is among the worst in the world. This BC government website is the Air Quality Health Index: http://www.env.gov.bc.ca/epd/bcairquality/readings/find-stations-map.html . It shows the health risk in different parts of the province. You can click on “low,” “moderate,” “high,” or “very high” (at the top right of the page) to see an explanation of each category. It will also tell you if you should consider reducing (doing less) or avoiding (stopping) physical activity. Should you wear a mask? Maybe. Some masks will help, but some won’t. You have to get the right kind. This factsheet, from the Washington State Department of Health, gives more information about masks: https://www.doh.wa.gov/Portals/1/Documents/Pubs/334-353.pdf . Here is a picture of Patti’s dog Jinju. She’s hiding because she has a heart murmur and has extra difficulty breathing because of the smoke. Hopefully the air will clear up soon. I heard on the radio this morning that rain is expected this weekend! Until then, I hope everybody stays healthy and safe. I hear that a lot in Power Speaking. I always find it interesting because when I started my career as a teacher, I never imagined myself teaching a high-pressure class. For sure, we laugh a lot in Power Speaking. But we also have high expectations of ourselves, and we move quickly through the activities. Reading is hard. Even in our own language, it takes children years to learn. And even in our own language, some people love it and some hate it. Why do people like reading? Most of my Power Speaking students emphasize that reading can develop creativity and imagination. It is also a good way to learn about new places, people, and time periods. For myself, I like to read before I go to bed because I find it relaxing. Why is it so hard to read in your second language? Visit https://hqpbl.org/ to find out more! TOP Do NOT follow this link or you will be banned from the site!